It’s official: the Han Solo solo Star Wars story is called Solo: A Star Wars Story. (This is the part where you pretend to be surprised.) 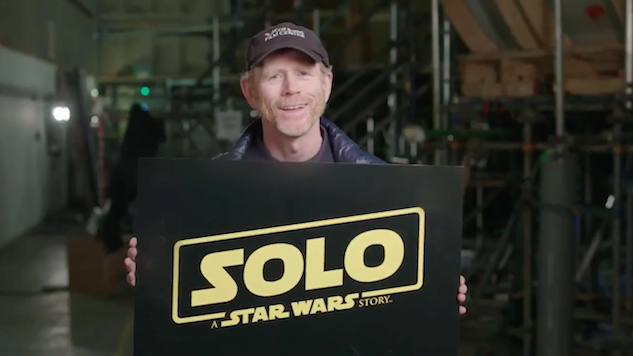 Famed director and sarcastic Arrested Development narrator Ron Howard announced that filming of the once-troubled production has concluded in a Twitter video today. As Star Wars fans are likely aware by now, Howard replaced original co-directors Phil Lord and Chris Miller, who were let go by Lucasfilm after creative disputes and culture clashes. Howard was brought in by Lucasfilm to salvage the situation and helm the film through new reshoots—such reshoots resulted in changes, such as the loss of Michael K. Williams’s character. Reportedly, Williams’ role appears to have been replaced by a new character portrayed by previous Howard collaborator Paul Bettany. As the director mentioned in the above video, Howard has utilized social media to give little hints and teases during filming. The official Star Wars website compiled all of his social media posts here. Despite all of the tumult behind the production, and contrasting with another shaken-up Star Wars project, Solo is still due for its Kessel run on May 25, 2018.